Located in the foothills of the Himalayas, Manas at one time is a National Park, a UNESCO Heritage Site, an Elephant Reserve, and a Project Tiger Reserve. If that is not enough, it has also been recognized as an important Biosphere Reserve. The wildlife of the park does more than justice to these accolades as you will find a wide range of rare and endangered animals dominating the landscape. Spread over an area of 950 sq km, the park is host to animals like Assam Roofed Turtle, Hispid Hare, Golden Langur and Pygmy Hog, which are not only endangered and rare, but considered ecologically important. The park also has a significant population of Wild water buffalo. The name of park is derived from the serpent goddess Manasa. The park is bisected by the Manas River which happens to be a major tributary of the Brahmaputra River. When the park was for the first time declared a sanctuary on October 1, 1928, it had an area of 360 sq km, which increased by another 391 sq km beween 1951 and 1955. The park today also has a core area of 2600 sq km. In1985 it was recognized as a UNESCO World Heritage Site, but soon after things began to go wrong for the park and by 1992, it had to bear the agony of being listed in UNESCO's list of world heritage sites in danger. Heavy poaching was taking a toll on the park and many species were facing extinction, forcing the park authorities to take some stringent measures to stem the rot. This paid off as in 2011 it was finally removed from the List of World Heritage Site in Danger. Today the park is amongst the best in the country and is ecologically important considering that it is home to many rare and endangered species. The flora of the park is as diverse as it gets. The vegetation of the park is mostly covered with mixed deciduous forest which is also strewn with small grass on which the deer of the park thrives. In fact the abundance of food is a major reason for the large population of deers and other herbivores in the park. The Burma Monsoon forests of Manas abuts the Indo-Gangetic and Indo-Malayan regions. 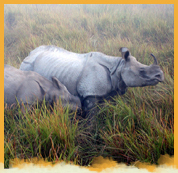 Manas National Park is also amongst the most biodiverse regions on the planet. a)	Sub-Himalayan Light Alluvial Semi-Evergreen forests which can be found in the northern parts of the park. b)	East Himalayan mixed Moist and Dry Deciduous forests, which is very common and present almost all through out the park. d)	Assam Valley Semi-Evergreen Alluvial Grasslands, which is another vegetation that is widely distributed accounting for almost 50% of all vegetation in the park. 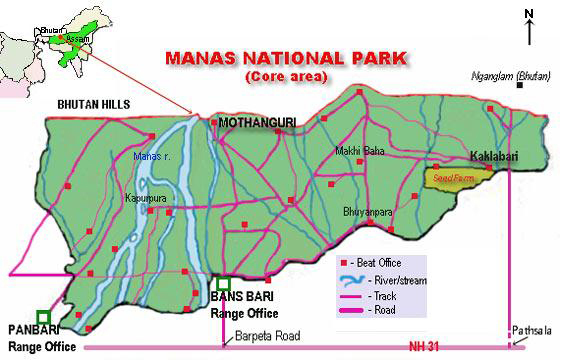 Manas is a relatively young forest, with much of its riverine dry deciduous forest going through the intial stages of forest succession. Close to the water bodies, dry deciduous forest gives way to moist deciduous forest which again as we move to the norther parts of the park changes to semi-evergreen climax forest. In the core zone of the park, as many as 543 plant species have been observed among which dicotyledons makes up for the largest chunk at 374 (89 of them tress), monocotyledons 139, and Pteridophytes and Gymnospers contributing the remaining 30. Some of the important tress of the park include Aphanamixis polystachya, Anthocephalus chinensis, Syzygium cumini, Syzygium formosum, Syzygium oblatum, Bauhinia purpurea, Mallotus philippensis, Cinnamomum tamala, Actinodaphne obvata, Bombax ceiba, Sterculia villosa, Dillenia indica, Dillenia pentagyna, and Careya arborea. Meanwhile the grassland of the park includes the like of Imperata cylindrica, Saccharum naranga, Phragmites karka, Arundo donax, Dillenia pentagyna, and Phyllanthus emblica to name a few. The park is landlocked between five districts -Kokrajhar, Chirang, Baksa, Udalguri, and Darrang in Assam, India, and has three ranges. Meanwhile, the normal temperature range of the park ranges between 15 degrees and 37 degrees. Being a tropical region, the park is also lashed by rains during the period May to September; the average rainfall recorded is around 333 cm. The Bansbari Lodge, situated in prime position right at the entrance to the national park, with tea gardens on one side, jungle and views of the Himalayan foothills on the other. It has 16 large twin-bedded rooms with attached bathrooms. The accommodation is run by MEWS society. Established on 3rdJan 2006,aims to work for the preservation of the rich bio-diversity in Manas . Musa Jungle Retreat can be compared to a futuristic, well planned Indian forest village with 24-hour power backup and water supply, encasing cottages that are a fusion between traditional and modern architecture. When it comes to animals, the park is as diverse as it gets and hosts some of the most fierce and aggressive animals on the planet; if you are wondering whether it doesn't have any graceful looking animals, which are of a more docile nature, then the answer is a big yes. Among the big cats, tigers, leopards, and clouded leopards are residents of the park, while Asian Elephants and Indian Rhinocerous are the docile looking giants with powerfully built bodies that you wouldn't like to take up a fight with. Other important animals of the park include Asian golden cat, Capped Langurs, Golden Langurs, Assamese Macaques, Slow Loris, Hoolock Gibbons, Smooth-coated Otters, Sloth Bears, Barking Deer, Hog Deer, and Black Panther. Some animals like the Assam Roofed Turtle, Hispid Hare, Golden Langur and Pygmy Hog are only found only in the park and nowhere else in the world, raising the profile of the park. When it comes to birds, the park has the largest population of the Bengal Florican, which is an endangered species. In all, the park has more than 450 species of birds, including migratory and game birds. Apart from the Bengal Florican, other birds of note include Giant Hornbills, Jungle Fowls, Bulbuls, Brahminy Ducks, Kalij Pheasants, Egrets, Pelicans, Fishing Eagles, Serpent Eagles, and Falcons. As Manas National Park is well connected and close to Guwahati, the biggest city in Assam, assessing the park is not a problem. By Air : LGBI Airport, Guwati, which is 176 km away from the park is the closest airport. Being an international airport, it is well connected to all major domestic destinations and a few internations as well. Upon landing in Guwahati, you can easilybook a taxi at any of the agencies providing trips to Manas. By Rail : The closest train station is located at Barpeta Road at a distance of 45 km from the park. From here you have to hire a taxi to reach the park. Travellers travelling from other parts of the country like Kerala, Mumbai, and Delhi are advised to better book their tickets to or from Guwahati Railway Station as it is well conneted to all these major destinations and also provides easy and convenient access to the park. By Road : If you are travelling from Guwahati, which is situated 175 km away from the park, you can either go for taxis or buses which are readily available. The journey will take you around four-and-a-half to five yours.